With the final day upon us the puppet theater crew could feel the "crunch time" in the air. Together we had come so far in both the design and construction of our production. In effort to create an entire puppet show in just 8 short sessions we had already achieved all our goals we had set out to accomplish on day one. We had made new friends, we had made mistakes, we had tried really hard and with an eight foot theater towering above all of us, we had definitely built something bigger then ourselves. But with just an hour before show time we still had a lot left to do. When we begun our afternoon not a single component was show ready or complete. The theater still needed work. The props still needed work. The puppets still needed work. With absolutely no time left for a first (final?!?) run through the stage managers held the doors to the auditorium (shop) while the performers decided on roles and slipped in a 2 minute a dry run (the troupes only) rehearsal before the one-time only performance. Meanwhile, we had a crew working on the hanging scenery: an oven with an opening door! We got to use the jig saw for making some important cuts. A new tool for many! We also hung fabric to cover the back of our theater. We used an industrial-strength staple gun to keep the fabric nice and snug. We also spent loads of tinkering time figuring out how to rig up the front curtain. Eventually, we decided on pulleys. But we realized our design only lifted the curtain halfway. And it seemed to work pretty well! MAJOR TINKERING HAPPENED HERE, TODAY! Our crew of puppeteers raised the walls of our theater and made huge progress on our first puppet, Bob-the-Builder (who, rumor has it, is now going to be a chef!). A group of four tinkerers came together to clamp the wall frames in place, drill a gazillion holes, and drive a bazillion screws. They worked in teams of two - one hole driller, one screw driver - modeling teamwork and efficiency! Next, we found big sheets of plywood to sheath the sides of our theater. Soon after, we got straight to work in our drill pairs! Oh Jeez! This was about the time that we realized we would need to move a board of wood that had been screwed in but was now trapped behind a big sheet of ply. We decided that instead of removing the entire plywood wall, we would instead remove the screws by other means! Out came the hand saw! Meanwhile, the puppet team was hard at work - finishing their design for Bob's body, cutting it out on the band saw, drilling holes for knees and elbow joints, and putting it all together with screws, bolts, and nuts! At the end of the day, we shared details of our progress, stories of both challenge and appreciation, and goals for the upcoming week. Today, we put a lot of screws into the walls of our huge boot. 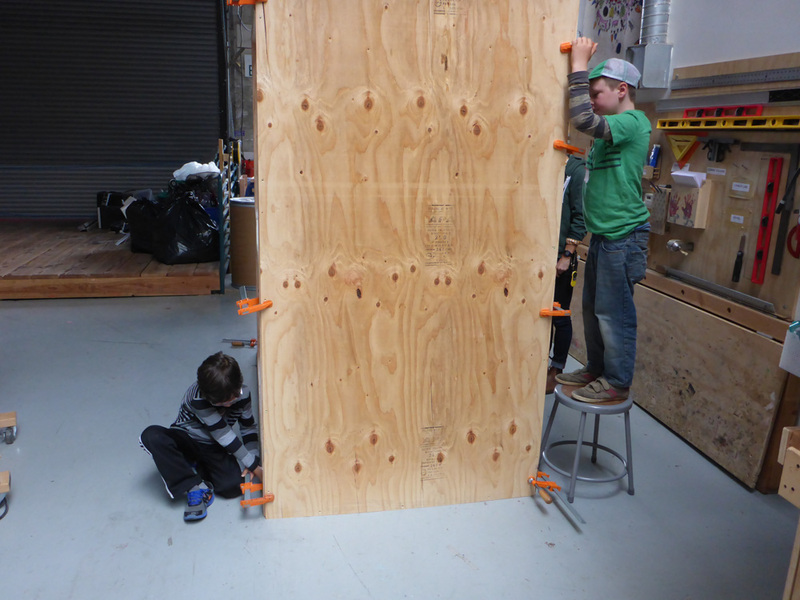 We started to attach a wacky, hole-y piece we found in "scrap alley" last week before realizing that we needed to attach an extra to keep it from wobbling! When attaching the plywood, we realized we made a mistake—we needed spacers between the ply and the structure walls to be able to attach it. Luckily, small hands are really good at drilling in tight spaces! We also started working on wheel supports, cutting 2x3s to make cross-beam supports under the shoes and braces for the wheels. 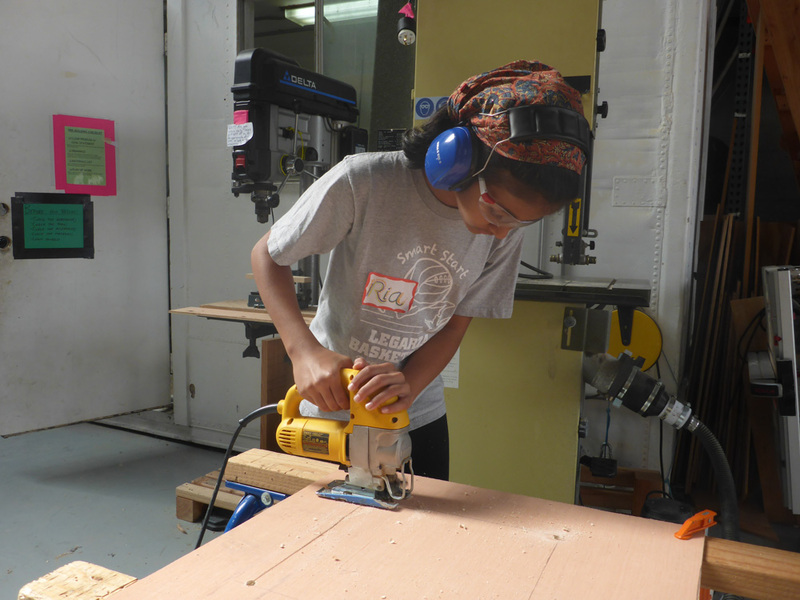 The drill press helped us line up our bolt holes — and was super exciting to use! We realized we needed a door! 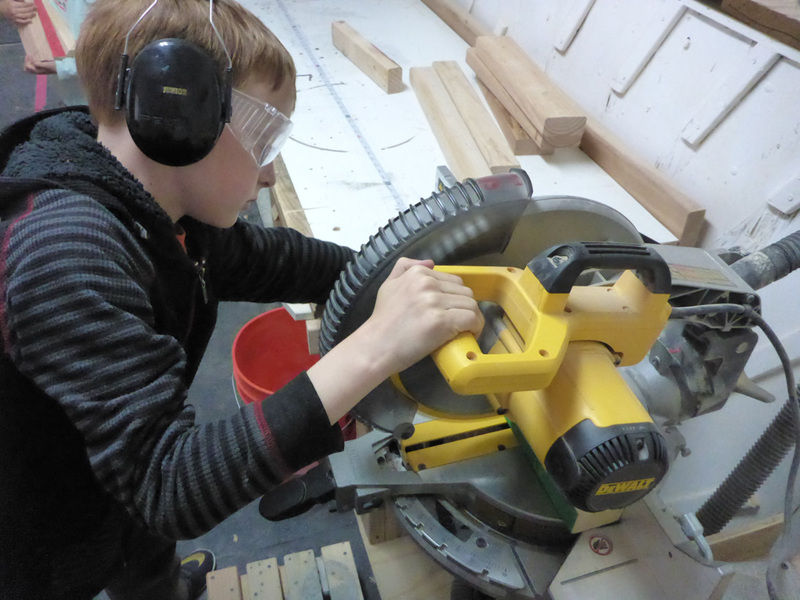 So Jack and Sloane got on it - cutting a door panel to shape using the band saw. With our team reunited after a week (or for some two) apart. We had a full house of tinkerers ready to tackle our puppet theater. The previous session we had determined two very different components for our project (puppets and a theater for them to act on) as well as a list of some solid suggested features needed for the both. For example, the theater needed a stage, curtains and a setting. The puppet(s) needed joints and movable parts that could be controlled by the kiddeos (ideally without being seen). Clearly two different groups were going to emerge. As collaborators we often try to anticipate the direction a group will take a project to help us prepare rudimentary designs that may help inform the kiddeos ideas leaving us with lots of time to tinker with the more complicated and often exciting parts a project may encounter as it progresses. Other times the designs are completely kid driven and we are often left trying to sort and sift through their sometimes overwhelming ideas in effort to capture everyone's collective desire in a plan that reflects what they want and will (hopefully) work. This was exactly the case presented to us on our third session by this very bight and headstrong group of builders. Before opening circle was even over our previous sketches were rendered best recycled. So we broke into two groups the theater design capturing all but two members of the groups attention. Theater design: kids ended up deciding that puppets would be controlled from below the stage with setting changes raised and lowered from a fly gallery above. Puppet design: the puppet team explored how to control moveable joints from both above and below. The team was worried about the strings for a marionette getting all tangled. After we design we get to building. And finish the day by sharing stories of personal struggles and others being awesome! What a diverse mixture of expressions accompanied the kiddos who strolled into the shop for the first day of Thursday after school this spring. Some bounded in offering hugs to collaborators, excited about being a year older (eight) and therefore able to enroll in our "middles" session. A few were returning fresh from last week's Spring Break Camp feeling confident and ready for more! As we've come to expect some were simply stoked on the thought of being trusted with power tools. Then the last few timidly approached the shop, one foot slowly in front of the other with blank stares and an apparent concern about what their afternoon was about to hold. Right away I knew we had the perfect mix of the diversity required to come together leverage our collective strengths and equip each others tool belts. I believe this group is prepared to share in the sort of great failures required for us to learn how to build something awesome, together! But first: we had ask a lot of questions about how to treat each other and the space. Opening circle introductions- Wolf shares how he would adopt an animal's mutation to change the color of his skin to match his surroundings. Also questions about how to safely use the chop saw, clamps and drills. Lindsay says, "Knock on this wood. It's pretty hard, right? If this saw can cut though it, it can easily cut through you. So let's lean how to operate it safely." Nic asks Ria, "Well if these pieces are the same height, what could we do to get rid of this gap and clamp a piece across it?" "Ryan, it's time to take out our screws and clean up but what could you do next time to stop that frame from moving around?" In the end I believe a great time was had. Can't wait to pick up where we left off and do it again next week.